Retrolite brand high temperature retro-reflectors or retro-reflective targets are designed for use as a permanent photoelectric target where ambient temperatures are as high as 900°F. The target will retro-direct light in the entire visible spectrum as well as in the infrared. Industrial applications for Retrolite retro-reflective targets include injection-molding installations, foundries, bakeries, heat-treating facilities, conveyor lines, paper and textile mills, and safety interlock systems. Brightness: Expressed as times brighter than a perfectly diffusing white surface, the rating is 500X. Mount with screws, rivets, clips, or frame. The metal target can be punched and cut without impairing the reflective quality, but reasonable care must be exercised in handling to avoid severe flexing or abrasion. Wash with detergent to remove oil film after handling. 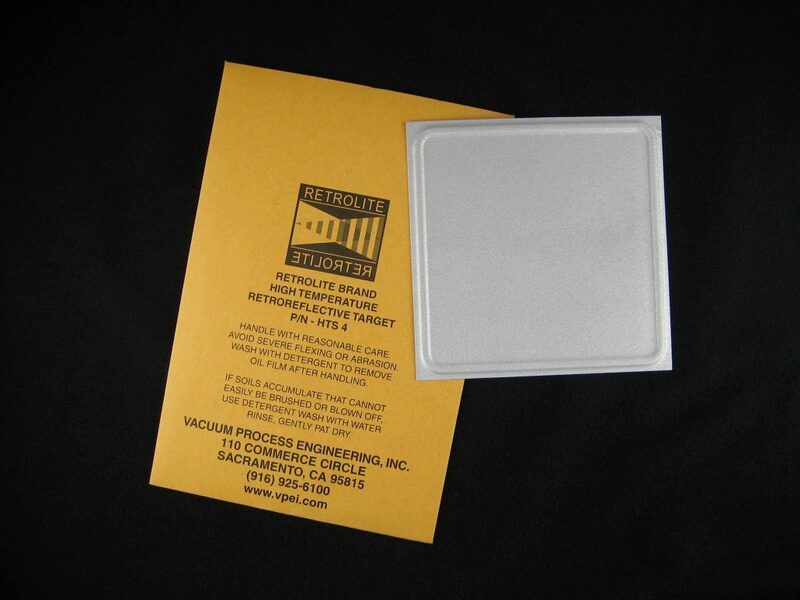 If oil or water is likely to accumulate, retroreflective targets can be protected with a glass plate and sealed.